The recent primary elections in Zanu-PF and the MDC Alliance were eye-openers. In both camps, there were claims of manipulation of cell registers, alongside allegations of candidate imposition and vote-buying. This is unacceptable in a contemporary democracy. Zanu-PF Presidential candidate Cde Emmerson Mnangagwa noted that “whatever challenges we face in the interim must thus be in the direction of firmly rooting the democratic ethos”. I entirely agree with this notion. Zimbabwe is emerging from a socio-economic and political recession characterised by economic regression and decay of socio-political institutions and values. Now that the primary elections season is largely behind us, perhaps there are some key principles that we can apply to our future primaries to facilitate the democratisation project that began in November 2017. This article intends to highlight some key aspects of the Sadc principles and guidelines governing conduct of democratic elections, and how they can be applied to intra-party elections. The purpose of primary elections is to ensure, firstly, that a political party’s democratic processes are alive and efficient and, secondly, that the will of the rank and file prevails in selection of leaders. If the will of the majority rank and file prevails, this automatically serves as a deterrent to factionalism and imposition of candidates, because genuinely popular leaders will stand as the party’s representatives and they will have the support of the grassroots. Conversely, if candidates are imposed, or the will of the rank and file is subverted in a particular constituency, then this will automatically affect that party’s performance in that constituency on Election Day, chiefly because votes will be lost through apathy and protest voting. Unfortunately, over the years, it seems as though the will of the rank and file in political parties has been repeatedly subverted through vote buying, manipulation of voter lists, imposition and coercion. Irrespective of where such skullduggery occurs, it only serves to weaken a party’s performance in a national election. Nevertheless, for future primary elections, it is possible to strengthen intra-party electoral processes by applying key aspects of the Sadc guidelines to primary elections. There are three key aspects of the Sadc principles and guidelines governing conduct of democratic elections that can perhaps be applied to internal polls of political parties across the political divide. 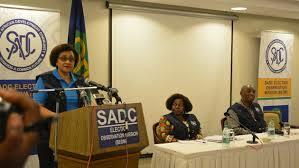 The first is the emphasis on external election observers that comprise representatives of various Sadc states. It is this observer mission that finally compiles a report which it submits to Sadc. The insistence on external observers is meant to ensure objectivity and impartiality when observing the electoral process. In terms of intra-party electoral processes, the same principle can be applied by inviting independent and external electoral bodies to oversee internal electoral processes. In Zimbabwe, for instance, this would translate to allowing civic society organisations and even the Zimbabwe Electoral Commission to observe and/or oversee primaries. This is not unheard of. In South Africa we have seen the Independent Electoral Commission overseeing the ANC’s internal electoral processes. It was the IEC that oversaw the ANC’s December 2017 conference, where Cyril Ramaphosa was elected president of the ANC. By allowing external and independent bodies to oversee their internal electoral processes, Zimbabwe’s political parties will avoid the headaches of dealing with factionalism, vote-buying, bribery and those type of machinations which ultimately impact on party unity and cohesion. The second guideline is premised on the need to promote the principle of “Promoting and enhancing adherence to the principle of the rule of law premised upon the respect for, and supremacy of, the Constitution and constitutional order”. In this context, when primary elections are conducted in any party, it must be ensured that contesting candidates and party supporters alike wholeheartedly adhere to the party’s constitution and the national constitution. If a candidate or party supporter infringes upon the party’s constitution, then that candidate should be swiftly and heavy-handedly sanctioned. Aspiring candidates who use violence to intimidate their opponents should be barred from participating in elections for infringing on citizen’s constitutional rights. In fact, wherever threats, coercion or any form of violence occur in order to intimidate opponents or rank and file members during a primary election, then such an election must be immediately nullified and a re-run ordered. Finally, it is key that officials within political parties who are responsible for mobilisation and electioneering regularly undergo a training programme with respect to the Sadc guidelines. In this light, perhaps it is worthwhile for leaders in Sadc to consider introducing an annual symposium which brings together the relevant political formations in the region to understand the importance of applying these regional standards to their primary electoral processes. This will not only encourage the long-term democratisation of Sadc states, but will also facilitate regional integration and cooperation.